US based Asia Coal Catalyst Company (“ACCC”) produces CC-88™ a patented Combustion Catalyst. 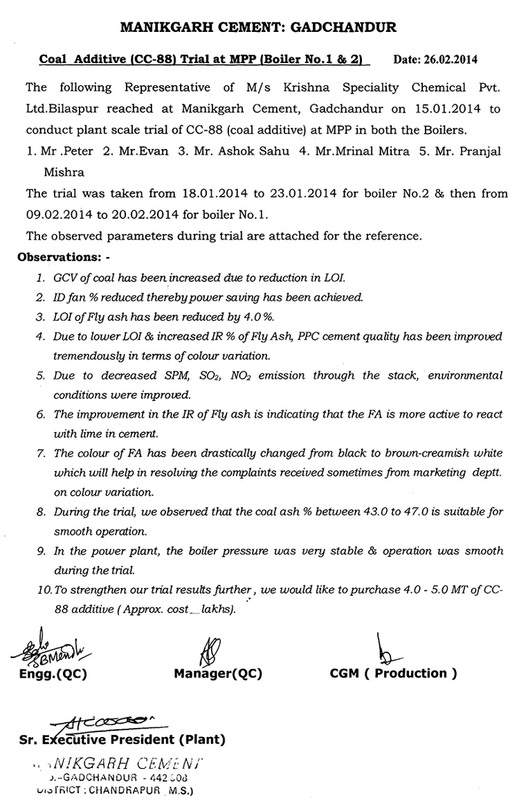 CC-88 was proven effective at Mankgarh Cement saving coal and improving the clinker quality. A successful demonstration showed that CC-88™ combustion catalyst increased the GCV of coal per tonne due to a reduction in L.O.I. (loss on ignition). The purpose of the demonstration was to show positive effects of using CC-88™ on the combustion of the local coal used at Manikgarh Cement. ACCC successfully showed that CC-88™ improved combustion efficiency of the 15MW captive power plant boiler. • CC-88™ usage reduced auxiliary power, i.e., Fan power for the ID fan achieving power savings. • Due to lower L.O.I. & increased IR% of fly ash, PPC cement quality has been tremendously improved in terms of color variation. • CC-88™ made a tremendous improvement to the color of fly ash from black to cream-white making ash significantly more salable. Asia Coal Catalyst Company is very proud of our products and thanks Manikgarh Cement for the opportunity to demonstrate how CC-88™ Improves combustion efficiency of coal in industrial AFBC boilers. CC88™ cleaner coal technology helps both industrial and utility boilers to fire at a consistent rate, assisting boilers to achieve their maximum load. CC-88™ reduces stack losses of unburned carbon and reduces unburned carbon in fly ash. CC-88™ allows operations at lower excess air, reducing plume opacity and reducing NOx. CC-88™ helps keep PM (particulate matters) emissions under control. Slag costs the power industry billions $ per year. You’ve Heard Of Coal. Ever Hear Of Slag? Globally coal is continuing to serve the modern and developing world’s energy interests. Any energy expert will tell you the power and influence of Coal on the power sector is undeniable. Coal is cheap, abundant and available to developing countries that intend to utilize it. Coal will remain popular in coal dependent Asian countries like China and India; experts predict coal will remain as the dominant fuel source for the next fifty years plus. As time marches forward and more and more higher quality coal is mined and consumed, this leaves a growing problem. There becomes more and more low quality coal left over that must be consumed. As more power plants are forced into using lower quality, lower BTU coal and higher ash coal types, they must contend with numerous challenges. Poorer quality coal types tend to be more difficult to burn and tend to negatively impact on boilers performance. It also should be noted that boilers burning lower grade coals are being kept running at higher operating load for much longer periods of time to make up for the lower heat values of the lower BTU coal burned. Due to the deteriorating quality in available coal, boiler operations have become more challenged. Poorer quality coals have caused many boilers to experience increasing slag deposits on the interior furnace walls, air preheater and super heater sections of their boilers. When a boiler has severe slagging in the boiler combustion chamber it forces the boiler to be shutdown for mechanical cleaning. All unscheduled or unnecessary shutdowns cost the boiler operator a lot of money. Severe slagging causes many different operational problems such as production delays and production losses, sometimes if the boiler is producing power there are other economic penalties. Unscheduled shutdowns due to slagging costs boiler operators billions of dollars per year in lost productivity. What is slag and what causes slagging? Coal contains carbon, hydrogen and oxygen – all of these are combustible, however, there are numerous inorganic impurities that are not combustible and contribute to slagging. The inorganic parts affect ash fusion temperatures. A particular coal type’s ash might be known for its tendency to slag and foul is related to the chemistry of the ash and ash fusion temperatures. Ash fusion temperatures relate directly to the propensity for slag formation in the boiler. When slagging deposits form on the boiler’s fireside surfaces and continue to collect the slag density also increases with time creating a deposit that is very hard and difficult to remove with traditional soot blowing techniques. When a boilers soot blowers cannot remove the ash build up from the upper recesses of a boiler in a timely manner, slag deposits can continue to grow, harden, and form very large and dangerous deposits. Slagging usually is occurring in the convective areas of the boiler where ash collects on the boiler tubes and internal surfaces inside the furnace, where it crystallizes and hardens. The slag than acts as a heat refractory, insulating the boiler rather than convicting the heat to the water inside the boiler tubes. The continual ash deposition on the furnace walls is what causes slagging and it occurs in the high temperature areas of furnaces directly exposed to flame radiation. In other areas these deposits are called fouling when they’re in other regions such as on tubes in the convection section of the boiler. Why is slagging so bad? When large slag deposits form they can unexpectedly fall. Falling slag can puncture boiler tubes; damage the floor of the lower furnace forcing an unscheduled shutdown and lost production. When a large slag formation falls it will often damage the system. In order to avoid severe slagging and unscheduled shutdowns, boiler operators are offered a fireside chemical treatment, CC-88. CC-88 is a fireside chemical treatment. CC-88 is added to the coal on the coal feed conveyor belt and fed into the furnace along with the coal. CC-88 has proved its ability to significantly reduce slagging, fouling and plugging of boilers burning coal. How does CC-88 work to reduce slagging? CC-88 plays a significant role in preventing the ash from sintering and fusing. Fusing and sintering describes the physical and chemical bonding of deposited slag particles. As sintering progresses, it results in increasing strength of deposits. Therefore preventing the ash from sintering and hardening is the objective of CC-88. CC-88 has a unique catalytic ability to generate oxygen, thereby enabling more complete combustion of more of the carbon contained in each tonnes of coal. CC-88 promotes a slow burning by softening the hard carbon deposits and cracking slag formation, penetrating their surfaces and further cracking, which increases the slag porosity, and promotes cracking at the surface of the ash, thereby making the slag easier to remove with soot blowers. CC-88 also work to decrease the melting point and friability of deposits formed from the ash constituents in the coal during combustion process. By changing the slag’s porosity makes the slag easier to remove during normal soot blowing and out-of-service cleaning. After use of CC-88 combustion catalyst, boilers slagging, fouling and plugging problem are reduced dramatically. Boiler Temperature profiles in the furnace and exit flue gases are consistently lower when compared to operating the boiler with heavy slag. Combustion catalysts improve boiler efficiency by extracting more heat energy from the fuel and by reducing heat losses when operating at minimum excess air. In addition, an effective combustion catalyst may reduce the level of smoke and solid combustibles and help a plant attain emissions compliance requirements that are not always achieved with the existing pollution control equipment. Combustion catalysts promote the combustion process by lowering the ignition temperature of the fuel, allowing for a longer burn time, and increasing the rate of combustion. Is “truly” clean coal attainable? China’s Electricity Council said the country will likely face power shortages of 30 million kilowatts this summer so the government has moved quickly to put restrictions in place as the peak season approaches. Big industrial provinces such as Guangdong and Zhejiang are already scaling back power consumption. These reductions are likely to hinder aluminum, cement, zinc and steel output. Coal powers the Chinese economy. The country is the world’s largest consumer, gobbling up nearly half of the world’s coal consumption in 2009. Coal accounted for 71 percent of China’s energy in 2008—more than three times the United States’ share. The Electricity Council estimates that the country’s coal demand will reach 1.92 billion tons in 2011, up nearly 10 percent from 2010. The Bohai-rim Steam-coal Price Index, a major indicator of China’s costs of coal for power generation, hit a new high of 808 yuan per ton in the week to April 27 since the index was launched in October 2010, according to the website China Coal Resources. Despite having the world’s largest coal based economies Asia is energy starved. 1.5 Billion people in Asia have only partial access to electricity, which is vital to a decent living standard. The life-giving but very complicated solution: electricity from coal. World leaders consumed with battling climate change are also taking to task extending electricity throughout the developing world. We are at odds with crisis . First we have an environmental crisis with global warming. At the same time a human crisis of the “energy poor” who don’t have access to electricity in the home. These people cannot purchase any common household necessities. The UN and World Bank will focus efforts to bring affordable energy supplies to the world’s poorest people. Most sensible environmentalists acknowledge that climate policy cannot forget aspirations of people in developing countries to lift they’re living standards. Energy poverty — or the lack of access to electricity in the home-represents a staggering challenge across the developing world. It is among the most critical issues raise the standard of living of the world’s poorest citizens. 33% of India’s 1.2 billion people live without access to electricity, and twice that number rely on wood or dung to cook. The dependence on wood for energy is environmentally destructive — for example, a major cause of deforestation — and a significant cause of ill health and early death due to hazardous indoor air quality. In the developed world coal and oil are what has fueled our industrialization: Coal powers more than half the world’s electricity, while oil fuels the world’s transportation system. It is immoral to deny India or Bangladesh the opportunity to enjoy the benefits of the modern hydrocarbon economy. Unfortunately fossil fuel like coal and oil are polluting. With 400 million people still living without electricity, India relies on coal for 69 per cent of its power supply and has the fourth-largest coal reserves in the world, after the U.S., Russia and China. Both India and China are rapidly expanding their coal-based power supply. Coal is by far the cheapest way to generate electricity. Its Energy vs Environment for billions of people. It will be a huge challenge to bring the two things together to address poor people’s basic development requirements. China made a “huge” move to convert it’s developing nation to a world leading economy. The “huge” move made was bringing electricity to the 100% of it’s 1.3 billion people. Now consumerism is taking hold of China’s 1.3 billion inhabitants. 1.3 people are buying rice cookers, refrigerators, TVs and Computers. China’s energy needs are at an all time high and continue to surge forward as China ’s economy grows. With stronger economic growth comes more electricity demand. As demand for electricity grows, so does the demand for coal and the need to conserve it. According to the International Energy Agency (IEA), China imported over 100 million tons of coal in 2009. China became a net importer of coal. Roughly 80% of China’s electricity is coal-fired power plants. This year power-generating capacity will increase another 10%. Asia Coal Catalyst Company will help China to conserve Coal. These are Chinas most highly polluting and inefficient systems, Many of these Boiler systems are designed to continue in service as long as possible to help meet China’s burgeoning demand for industrial steam production and electricity. A significant source of air pollution in China is use of relatively low-quality raw coal. A lot of the coal burned has high sulfur content (more than 5%). Very few power plants are retrofitted with flue gas desulfurization (FGD) equipment in China because of its high cost and when it is installed it is often left off due to high costs of operation. greatly to local air pollution. Although improvements in air quality have been achieved, ambient concentrations of suspended particulates are extremely high in most Chinese cities. High sulfur dioxide concentrations and acid rain are also high in areas where high-sulfur coal is consumed, particularly in China’s northern cities that have greater particulate pollution challenges to address. Southern China regions such as Guangdong also have serious challenges with particulate matter, NOX, Mercury and SPM. China’s coal inventories at power plants are full despite recent record power generation, according to China’s National Development and Reform Commission. At the present the China’s coal supply and demand was stable. Lots of coal ready to burn. China’s daily power generation surged to a new high of 13.179 billion kilowatt hours on July 7th and coal stocks in key power plants totaled 58.8 million tonnes as of July 8, enough for 18 days of generation. Power supply and demand were roughly in balance nationwide but electricity supply in Guangdong is a bit tight. In China Coal-burning power plants produce about 80 percent of the national power output. According to the latest data issued by the Chinese customs authorities, in the first half of this year China exported 10.14 million mt of coal, down 13.1 percent compared with the corresponding period of last year. Meanwhile, the total income from coal export sales for the given period was $1.05 billion, decreasing by 26.8 percent year on year. During the period in question, China’s average export price for coal was $103.3/mt FOB, declining by 15.8 percent from the same period of 2009. In June, the country’s coal export volume came to 1.27 million mt, increasing by 11.4 percent compared to June 2009, with the total resulting revenue reaching $188 million. In the month in question, the average coal export price was $147.8/mt FOB, up 48.1 percent year on year. On the import side, in the first five months of this year China’s total coal imports amounted to 68.98 million mt, up 114 percent year on year. According to current estimates, China’s coal imports for the whole year will reach 100 million mt. Thus, China is expected to remain a net coal importer in 2010. 1.4 Billion Chinese consumers are each day improving their standard of living. This new Ch;ina population is certainly deserving of all Creature Comforts like air conditioning, refrigerators, PC’s – these appliances are stretching China’s energy resources. Many Environmental Experts rightfully worry that China’s energy needs will have to rely on Coal for the unforeseen through distant future as an abundant fuel resources. While China is working hard to meet energy efficiency targets; the Chinese believe that for at least another 50 years fossil fuels will dominate. Fuels that are emitting carbon dioxide, sulfur dioxide, nitrogen oxide and other greenhouse gases will likely continue to grow for another generation or two. This past winter and spring showed the largest six-month increase in CO2 tonnage ever by a single country. 1.4 Billion Chinese consumers are each day improving their standard of living. This new population deserving of all Creature Comforts like air conditioning and refrigerators are stretching China’s energy resources. Experts worry that China’s energy needs will have to rely on Coal is an abundant fuel resources. China is working hard to meet energy efficiency targets. For at least another 50 years fossil fuels emitting carbon dioxide, sulfur dioxide, nitrogen oxide and other greenhouse gases will grow. The prices for coal set by annual supply contracts cannot be changed. All of the state run coal mine operators and coal industry leaders will work together coal prices steady. The largest Coal Company in China Shenhua has set its price of coal with 5,500 kcal/kg (NAR) was 570 yuan a tonne, while the spot price for the same grade of coal stood at about 760 yuan a tonne. The Chinese government is trying to help the power plants so they do not continue to lose too much money from high coal prices. The price of energy in China is set by the NDRC. Spot coal prices have remained stable over the past month as demand from energy-guzzling heavy industry slowed down and recovering hydropower generation took some demand off coal-fired power. Spot prices for thermal coal in Qinhuangdao, China’s top coal port, remain unchanged from a week earlier, with demand high with the arrival of summer when there is high coal and power consumption. Current Coal Coal with a calorific value of 5,800 kcal/kg (NAR) was quoted in the range of $114 to $116 US Dollars per metric tonne. Coal with a calorific value of 5,500 kcal/kg was between $110 and $111 US Dollars. There has been some return of hydropower generation following a drought a southwestern China which has eased power shortages some. © 2019 Cost of Coal Asia · Proudly powered by WordPress & Green Park 2 by Cordobo.